Firefighters, emergency responders, and disaster relief officials continue to do all they can to battle the devastating California wildfires. Through the generosity of people across the country, victims and responders are receiving some much-needed relief. CBS Los Angeles, the Los Angeles Rams, and the United Way teamed up to raise over $1 million for relief efforts with a day-long telethon. 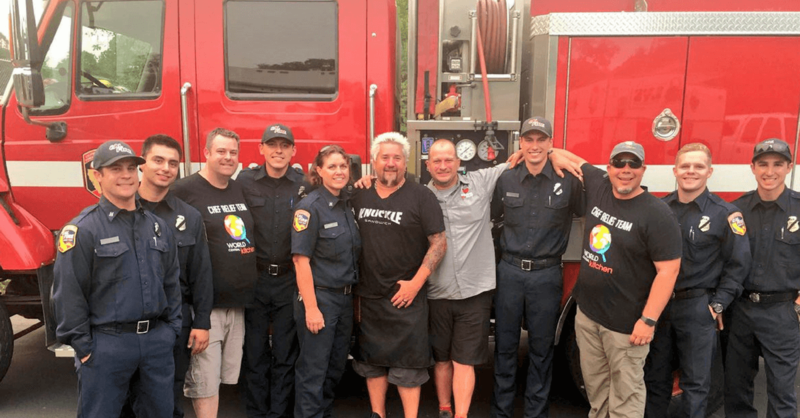 Celebrity chef Guy Fieri, the Salvation Army, the Red Cross, Operation Barbecue Relief, and World Central Kitchen have come together to cook meals for thousands of victims and first responders. Similarly, Dave Grohl visited several fire stations, delivering food as part of his new Backbeat Barbecue project. Sandra Bullock donated $100,000 to the Humane Society of Ventura to help in their efforts of evacuating animals from the fires. Ellen DeGeneres matched that amount with a donation to the Los Angeles Fire Department Foundation. Lady Gaga paid a visit to the Palisades Red Cross shelter and delivered hot food, coffee, and gift cards to the occupants. These are just a few of the countless examples of selflessness and kindness helping in small ways to those in need. Thousands of others are also helping by donating what they can, and heroic first responders are risking their lives to help. If you are interested and able to help, here is a helpful list of ways to ensure your contribution has a meaningful impact. Or, you can start your own fundraiser to support some of the incredible organizations on the ground by starting your own campaign on Givebutter.